Michael Edward Bruhert was born June 24, 1951 in Jamaica Queens, New York. He grew up south of the Long Island railroad and those who knew him said he was one of the nicest guys around. The tall 6’ 6’ right handed pitcher was originally drafted by the hometown New York Mets, in their pitching rich days of 1971. He was then drafted away by the Philadelphia Phillies and later returned back to the Mets in 1973. The local boy with his baseball connections, married the daughter of legendary Mets manager Gil Hodges. Buhert was both a starter & reliever in the minor leagues, spending a total of 12 seasons there. He went 11-9 with a 4.10 ERA, at AAA Tidewater in 1977, good enough in those days, to get him a spot on the 1978 Mets staff. 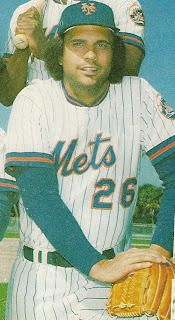 He made his MLB debut in the fourth game of the season, starting the second game of a double header at Shea Stadium on April 9th. He pitched well allowing three runs over six innings, but his team was shut out Montreal’s Ross Grimsley 5-0. Bruhert got his first career win in his next outing at St. Louis, beating the Cardinals 3-2 in six innings of work. On May 7th he pitched seven innings at Cincinnati allowing just two runs on two hits but got no decision. The Mets would go on to win the game later on a 9th inning John Stearns RBI single. He lost his next four decisions over the next two months and was put in the bullpen to straighten things out. 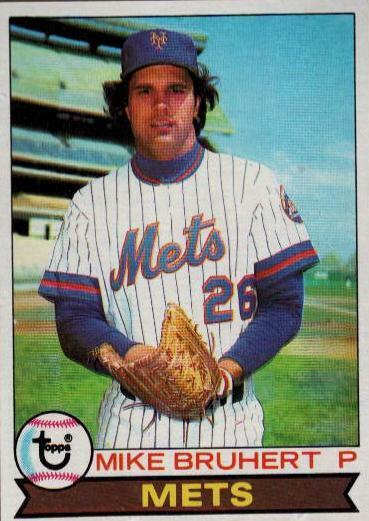 He got back into the ’78 Mets rotation by the end of August. Bruhert ended up losing five of his last six decisions in the month of September allowing 19 runs in 35 innings of work. On September 17th he pitched his best game, a complete game four hit shutout striking out five Phillies at the old Veterans Stadium. 1978 was Mike Bruhert's one & only season in the major leagues. He went 4-11 with 56 strike outs, 34 walks & a 4.78 ERA in 133 innings pitched over 27 games (22 starts). He allowed 71 earned runs on 171 hits & in 27 outings allowed at least one earned run in 25 of them. At the end of the season he was sent to the Texas Rangers along with Bob Myrick, for veteran pitcher Doc Ellis who was 3-7 for the 1979 Mets. 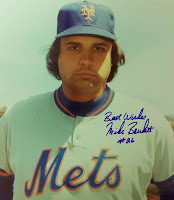 Bruhert never cracked the Ranger roster & pitched in the minor leagues through 1982 posting a life time 62-73 minor league record with 445 strike outs in 1163 innings pitched over 278 games. Retirement: After his playing days, Bruhert was the long time pitching coach at Fordham University in the 1980’s & 1990’s. There he coached two future MLB pitchers, the Mets Pete Harnisch and Miguel Jimenez. He divorced the former Miss Hodges & remarried with two daughters living out in Baldwin, Long Island. Mike, I'm looking for a pitching coach for my son, who just turned 13. Have concerns about how he's being used and his form. Have you any suggestions?